Miller Dynasty® 210 DX is an advanced 210 amp AC/DC TIG welder that is capable of AC and DC pulsed TIG welding. It features extended AC TIG frequency controls and allows the operator to choose between four different advanced TIG arc waveforms. The Dynasty 210 DX can weld up to 1/4 inch thick aluminum and 1/4 inch thick steel. The 210's inverter design makes this welder compact and lightweight (only 47 pounds). It comes complete with a memory card expansion slot for maximum flexibility and expand-ability. Miller's Autoline™ automatic input voltage sensing allows the Dynasty 210 DX to be hooked up to 120 volt to 480 volt, single phase or three phase, input power without manual linking. The 210 DX TIG welder offers full AC features, including advanced waveforms and wide ranges of balance and frequency controls. Miller Dynasty 210 DX TIG Welder 907686 can not be used with a spoolgun. Does the dynasty 200 use the same foot pedal as the 210? Does this include tig torch? Miller Dynasty 210 DX TIG Welder 907686 does not come with a tig torch. You can use the following contractor kits: Miller TIG/Stick Contractor Kit with RCCS-14 301311 Code: 301311 Miller® TIG/Stick Contractor Kit with RCCS-14 remote fingertip control is a 150 amp, ALL-IN-ONE Air-cooled TIG/Stick welding accessory kit for your Miller TIG welder equipped with a 14-pin receptacle. Miller TIG/Stick Contractor Kit with RFCS-14HD 301309 Code: 301309 Miller® TIG/Stick Contractor Kit with RFCS-14HD remote foot control is a 150 amp, ALL-IN-ONE Air-cooled TIG/Stick welding accessory kit for your Miller TIG welder equipped with a 14-pin receptacle. 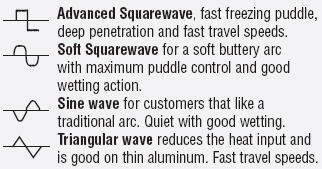 or for just the tig torch: Weldcraft�"� A-150 (WP-17) TIG Torch WP-17-12-R (12 ft.) WP-17-25-R (25 ft.) 150-amp air-cooled torch. Torch body gas valve models are available. Note: A-150 (WP-17) torches require 195378 connector. i understand this machine has ac or dc tig, does it have ac and dc stick or is it just dc for stick? Miller Dynasty 210 DX TIG Welder 907686 does both AC/DC stick. Miller Dynasty 210 DX TIG Welder 907686 will not power a suitcase feeder. Miller advises Miller Dynasty 280 DX CV Multiprocess Welder With CPS 907514007 will power a suitcase feeder. Can the miller dynasty 210 DX tig be hooked up to a water cooler? And what’s the difference between the 210 DX tig And the Miller 210 DX CPS? Miller Dynasty 210 DX TIG Welder 907686 can have a water cooler hooked up to it. The difference between the two machine is that the 210 DX CPS has CPS built in: Cooler Power Supply (CPS) is an integrated 120-volt dedicated-use receptacle for the Coolmate™ 1.3. Is there a 220 v 120 volt plug available for this or do we hard wire it into the panel ? without an available 120 plug this is not very portable . The Miller Dynasty 210 DX TIG Welder 907686 does not have a MVP. You will have to wire the panel accordingly to your needs with the machine. Does this machine have High Frequency, on the DC side, for welding stainless steel, where you do NOT want to scratch start the tungsten ? 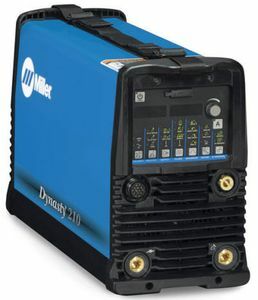 The Miller Dynasty 210 DX TIG Welder 907686 does have High Frequency in the DC mode. Would the circuits and boards have any nonconductive encapsulating or protective coatings for damp locations? Does this come with a torch or pedal? If there is a warranty claim, can It be taken to any Miller dealer? Or does it have to be shipped back to Cyberwed? If you purchase a Miller Dynasty 210 DX TIG Welder 907686 from Cyberweld and it develops a warranty condition you can take it to any authorized Miller warranty repair facility or you can return it to Cyberweld for repair. Is there any warranty with this welder? 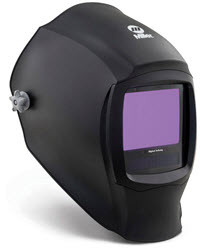 The Miller Dynasty 210 DX TIG Welder 907686 is covered under Miller's True Blue 3 year warranty. I decided on the 210 dx because of its portability, the auto-line feature is great. Arc starts are super crisp and the adjust-ability is awesome. Overall a great purchase. ConsThe expansion pack features should come standard. This machine works like a dream. I have it hooked up to 110 at the moment, and it still packs a lot of punch. I have no doubts that this machine will last for a long while. I couldn't be happier! ProsGreat arc starts Good penetration This machine is a boss overall. Sold my Miller Dynasty 200dx to buy this and wow am I pleased. First let me tell you Cyberweld had this on my door in literately 48hrs. They are fantastic to buy from. I opted for this model due to the rebate, if it was on the 280dx I would of bought that too. I was excited to open this and didn't forget that I needed to add a plug on the end (no big deal I had to buy one). Don't forget this is the machine only so you'll need the torch and pedal and any other thing you want to add. I will be adding a water cooler later but didn't get the CPS model maybe I should have? When I got the welder I "had" to update it, my version was T and they were on U. The update was really simple and a joy to install the blinking lights tell you when its finished. I am also glad that it came with a 3M Speedglas helmet free, maybe I'll keep it or sell it, I don't know. This 210DX goes to 10 amps unlike the 200dx that goes to 5amps but that's OK for me. The balance goes from 50 % (ball they call it) to 99% the 200 goes from 20% to 100% and the frequency goes from 20 to 400 which blows the 200dx out of the water. The 210DX also has all the Pro setting for Tig and Stick as well. Hope this helps anyone looking. This welder is the best I've ever used. After just under a year of owning this machine. It has done everything spectacularly. From 6010 stick, pulsed AC TIG, high pulse DC TIG, HF start or Lift start, it doesn't matter. You tell the machine what to do and it does it. Works wonderful on 120V 15a outlets as long as you respect the duty chart. ProsOn 240V: Enough power to and force to burn a 3/16 7018, and keeps 6010's lit almost 3 inches away from the material. 100% duty cycle at 175 amps and 60% duty cycle maxed out on TIG. I promise you, it will out weld you. On 120V: welds 3/32 6010 and 125 amps on TIG all day on either a 15a or 20a breaker. Have yet to trip a breaker sticking to those ranges. TIG advanced settings are endless. And if you know what each setting does, you can fine tune your arc for almost any application you can think of. This thing is meant for high quality, high precision aluminum welding. And the settings I'm allowed to adjust attest to that. Extremely portable sling the strap over your shoulder and go! ConsHas a trouble pushing slag back on 3/32 7018 on 120V but that's to be expected. I wish it came with the carrying handle the 200dx had so I wouldn't have to use the strap all the time. Best price anywhere, hands down! Nice smooth arc, runs on many different currents. BEST MACHINE I HAVE EVER USED ! I'VE BEEN A TIG WELDER FOR OVER TWENTY YEARS AND HAVE USED MANY MACHINES,THIS IS THE BEST. I FOUND IT HARD TO BELIEVE BUT THIS MACHINE RUNS 140 AMPS NO PROBLEM ON HOUSEHOLD 110. I'VE BEEN WELDING 1/8 ALUMINUM AND STAINLESS EVERY NIGHT FOR A WEEK NOW. THIS MACHINE FAR EXCEEDS MY EXPECTATIONS. CYBERWELD AND MILLER DELIVERED !